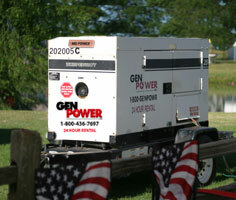 Generator is not intended for use in enclosed areas or where free flow of air is restricted. Backfeed to a utility system can cause electrocution, shock and/or property damage. DO NOT connect to any building's electrical system except through an approved device or qualified electrical contractor. Features and equipment specifications subject to change. Please consult Gen Power for details.